Worthing Court’s Christmas foyer decor is fun and festive this year! I’m ready to welcome friends and family alike into our home. 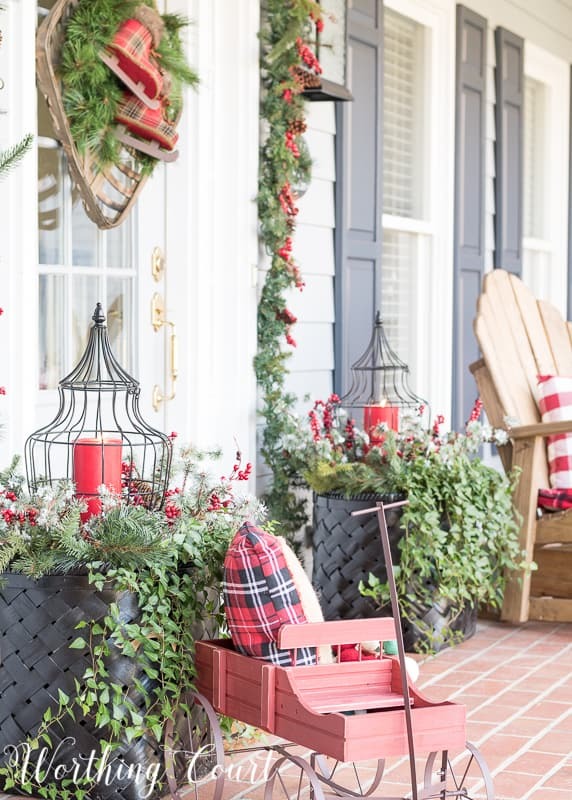 My entire home is filled with bright and cheery Christmas red sprinkled throughout every room, which is just the way that we love it. Come on in! I’m thrilled to be a part of the Home For The Holidays Christmas Tour organized by Jenna at Wife In Progress. The links to everyone’s blog for the rest of the week are below. If you’re joining me from The Fat Hydrangea, I’m so glad you’re here! Isn’t Sara’s home just lovely? I love all her inspiring ideas and diy projects. 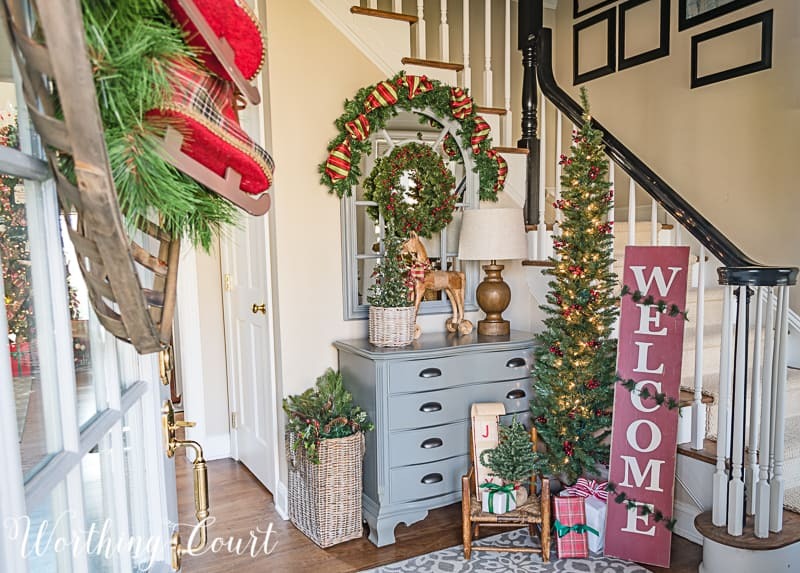 My goal with the foyer was to set the tone for the rest of Christmas, so this great sign says it all…WELCOME! 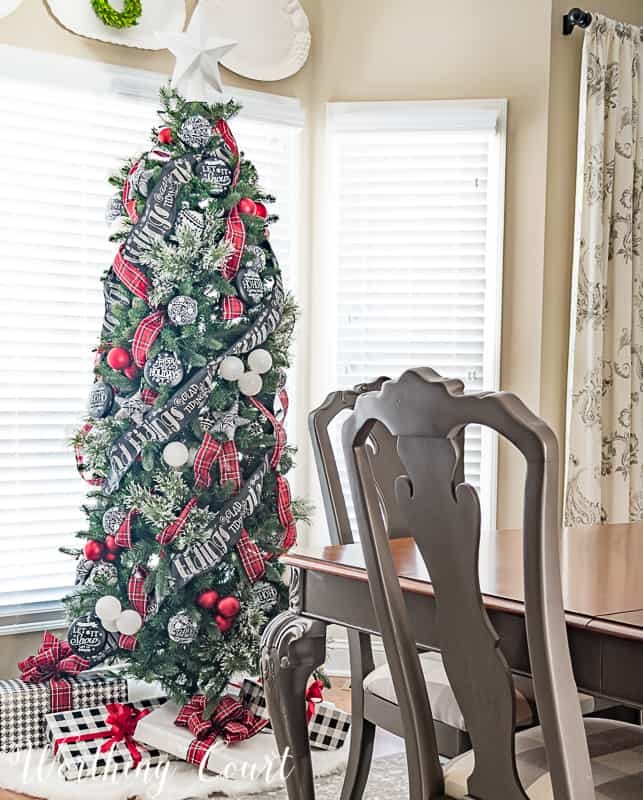 A new skinny tree, vintage family heirloom chair and a few gifts fill the corner in front of the small chest nicely. 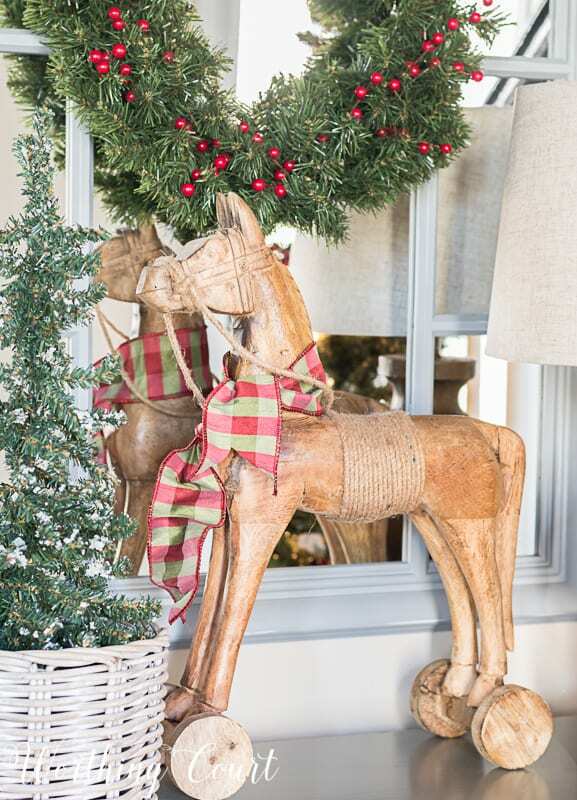 A garland with some luscious silk ribbon woven through it is a great way to draw your eye to the arched mirror and my wooden horse, who also has a bit of coordinating ribbon around his neck. Notice the empty frames going up the staircase? Yeah – the final touches of my foyer makeover kind of stalled after the purchase of our beach condo, where we been working our you-know-what’s off for the last few months. My foyer is a real workhorse of a space in terms of traffic flow. It contains openings to the family room, office and the stairway, plus there is a closet for coats. All those openings and the closet door made it a quirky space to arrange. It was easy to know what to put in the corner-nook by the staircase, but I was a bit stumped with what to do with the large plain wall leading into the office. The addition of a board and batten wall and matching diy benches dressed that wall right up. Now it’s a favorite spot in the house to change up seasonally! By the way – you can see the complete transformation, with before and after photos of our office HERE and our family room HERE. The hooks that I added to wall were originally meant to hold excess coats when we have company and our coat closet is full, but 95% of the time the hooks are filled with seasonal tidbits. Oops. The decorations in my foyer set the tone for the rest of the house. Here’s a peek into our family room, looking directly from the front door. I hope you’ll come back in a few days to take a closer look at the tree and to see the rest of the family room! Thank you for stopping by to help me celebrate Christmas! Your next stop will be at Wife In Progress – our hostess! You won’t want to miss the inspiration from every single person, so be sure to visit all of the blogs. 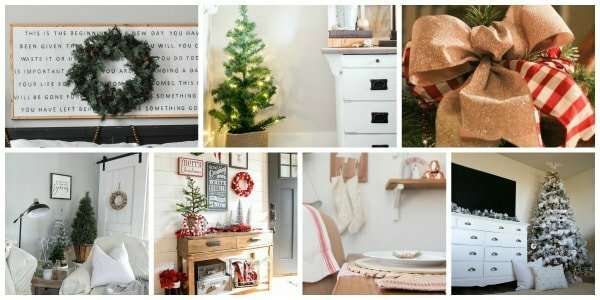 Then, come back every day for the rest of the week for loads of amazing Christmas inspiration and decorating ideas. I love that you don’t stick to the popular white on white like most bloggers do! 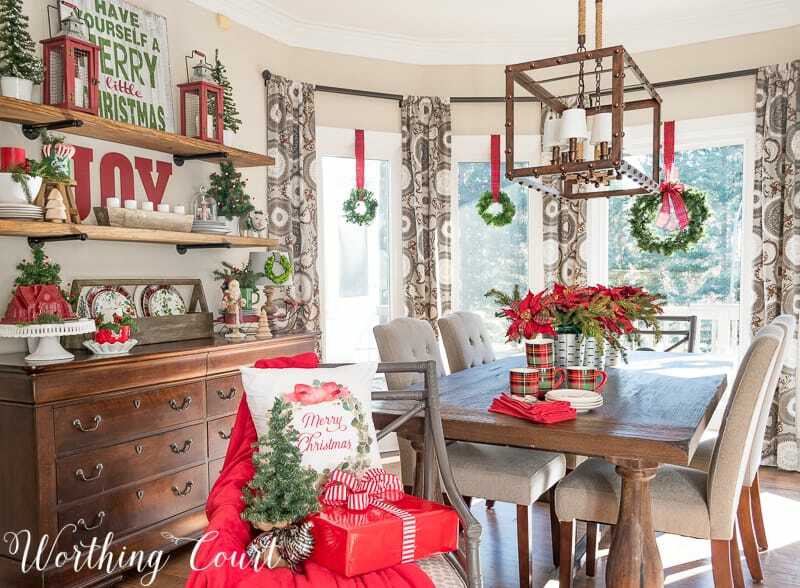 When I decorate my home for Christmas I love the traditional red and green, you did a beautiful job! Great room decorations. I love how there is always a little whimsy as well. You have made a very cosystem and welcoming foyer, just the way I love. It is a feast for holiday eyes. Thanks. Above should read cosy and welcoming! Marvelous details Suzy, just outatanding! WOW Suzy your entry is just gorgeous! 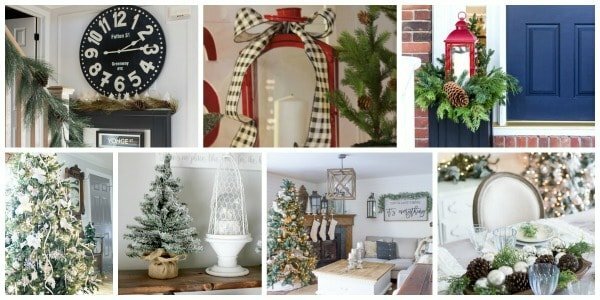 I love all of the traditional Christmas colors and especially how you have decorated your board and batten! Those benches are perfection! SO fun to join you on this hop! I love your inspirations! Happy Holidays! Your foyer is so colorful, cozy, and welcoming! 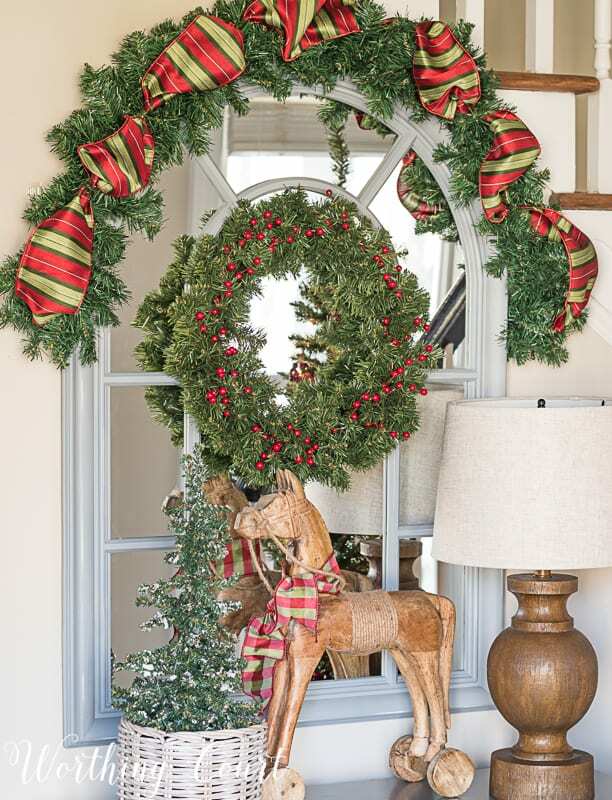 I love the red and green and all the attention to detail in every corner of your home. Thanks for sharing! 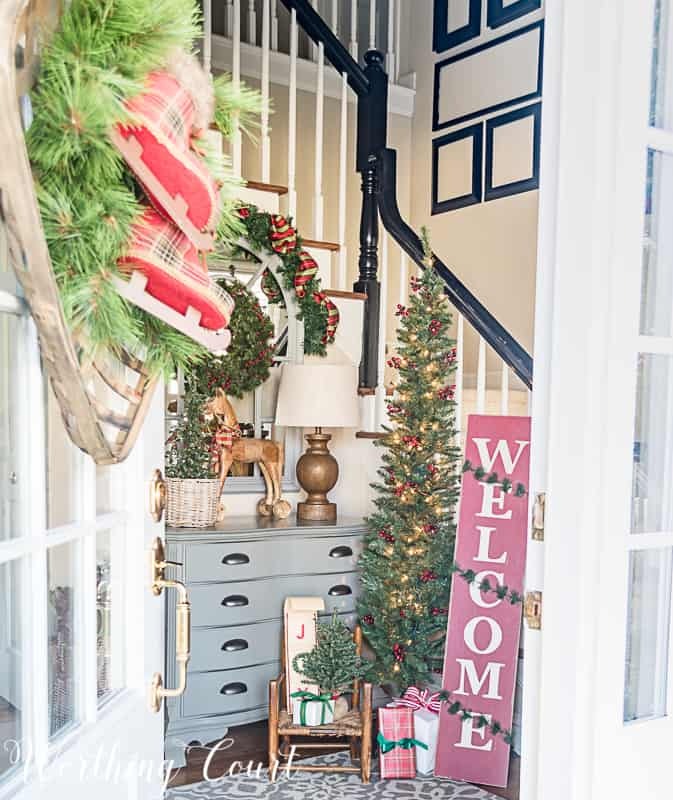 Your Christmas foyer is beautiful! I love all the touches of Christmas that you have added! Could you tell me where you got your little white pig with the wreath around its neck? I want to thank you for giving me the love for wreaths!!! Hi Kay. 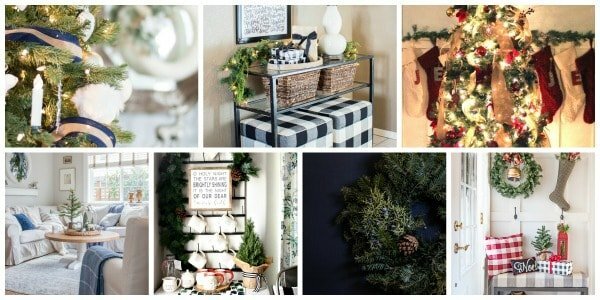 I’m obsessed with wreaths and use them everywhere! 😀 I found the little pig at a local shop last year. I think the brand is Raz, if you want to try to find one online. I love your house!! Each room is decorated so festively! And I also love that you used red and green throughout. All of your decorations are wonderful! Your home looks so welcoming, I love the foyer and all the decorations are gorgeous. Thanks for sharing and have a wonderful Holiday! Merry Christmas! Just beautiful, Suzy! so inviting and welcoming. Best wishes for a joyous Christmas to you and your family. Merry Christmas + thank you so much for participating in this blog hop with me!! So stylish, Suzy! 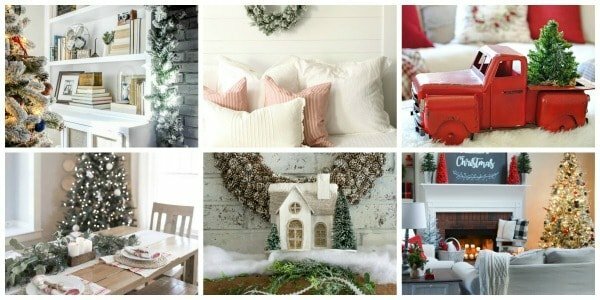 I love all the Christmas touches and it looks so inviting. I wish I had a foyer like that! Hopefully when we move in a year or so,I will have one. Gorgeous. That pretty horse stops me in my tracks every time I see it. 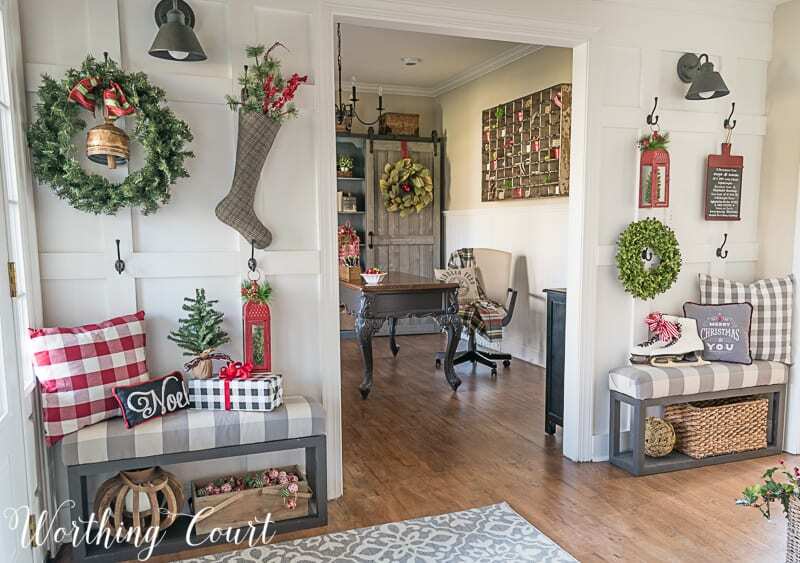 Suzy, you had me at Welcome with your entry tree and wreath, but then I saw the benches placed on each side of the office entry with the board and batten wall and I fell in love. Such a smart idea and it looks so festive for the season. Happy to be on the blog hop with you. Suzy, I love your use of traditional Christmas colors, and how your decor is so festive. That board and batten wall is gorgeous and you have styled it to perfection! 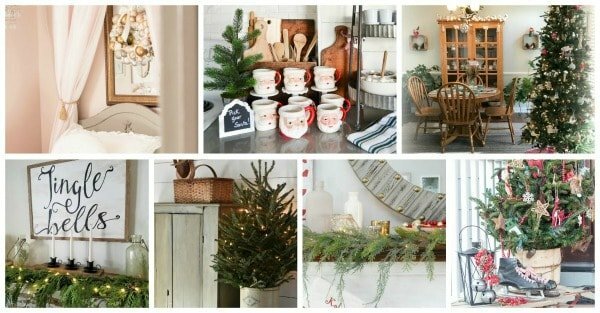 Very cheery and festive home! 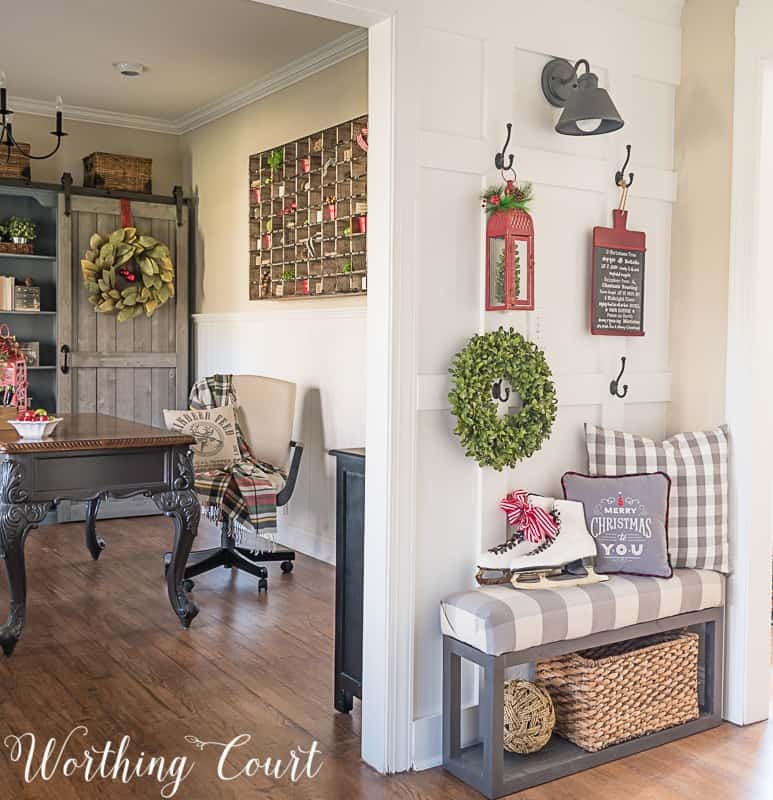 Love all the red, and that board and batten wall is perfect! As always, YOUR HOME IS BEAUTIFUL! I love everything you added for the season! It is fun touring with you this week! Such a beautiful tour! I love all of your traditional colors and touches! Love your foyer, Suzy! 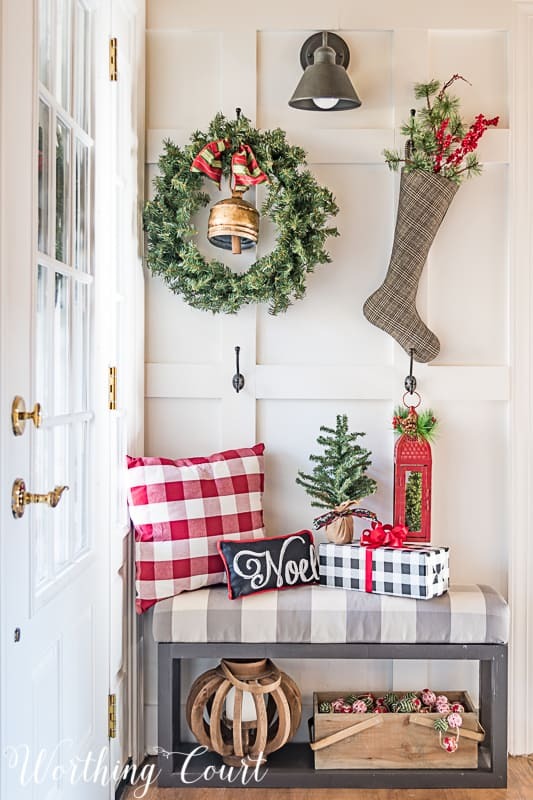 It’s so warm and inviting for the holidays – just what an entryway should be! Your house does Christmas SO well, Suzy! LOVE what you did this year. I am really into red this year also. I did see one teeny tiny thing I would change – the greenery in the basket on the family room wall behind the couch. I would change that to pine or other holiday greenery. 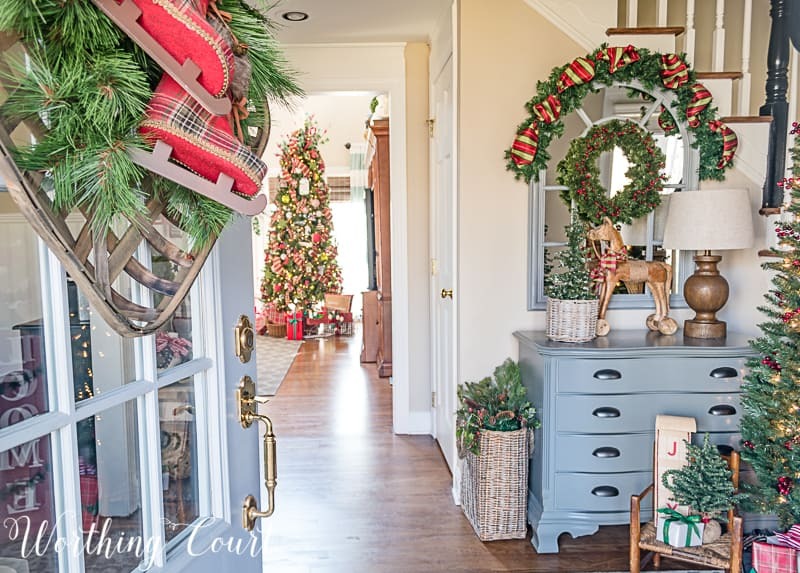 Suzy – What a stunning entryway! 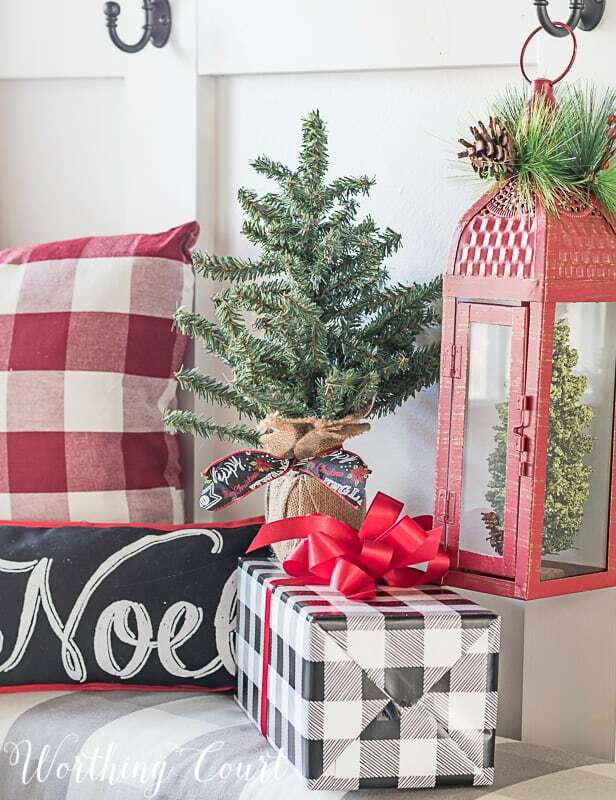 I already am swooning over your tree, and this – this gives me all the feels! So beautiful my friend! Merriest of Christmases to you and your family this year! Oh, Suzy, your home is so LOVELY and totally inviting! 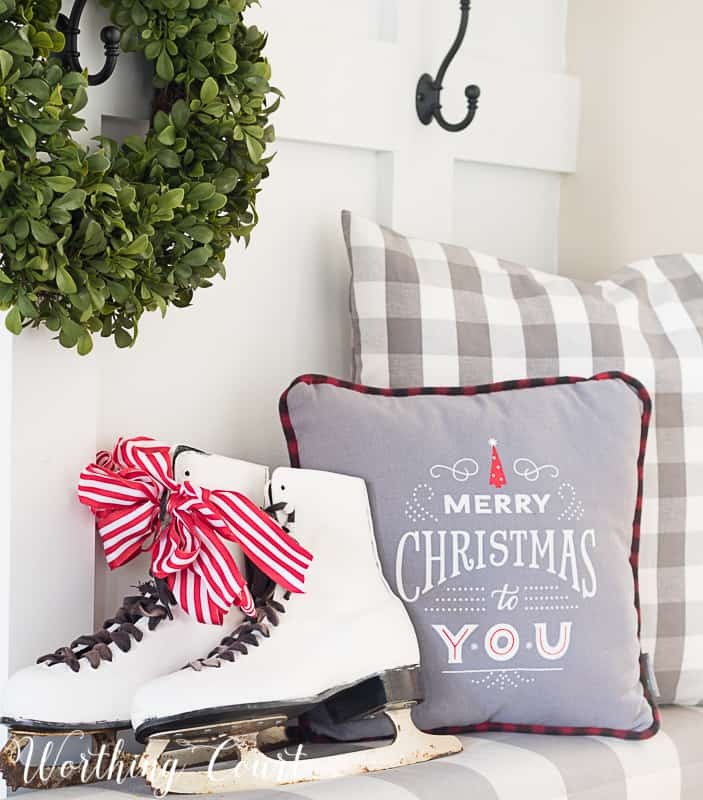 I need to find some old ice skates to decorate with. What a fun addition they are! Your house is perfection Suzy! I would love to celebrate Christmas at your house. Just beautifully decorated as always! When I imagine the ultimate Christmas home, I think of yours! It’s always so amazing! Love each little details! Wonderful tour! I love the ice skate wreath! I bet everyone who came to your house this season was just amazed! So welcoming, Suzy. Love the red and green (obviously catching-up on my blog reading).